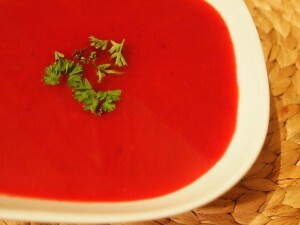 Borscht is a traditional Ukrainian soup with a gorgeous purple-red hue. It’s a delicious way to use beets and can be served hot or chilled. In a large soup pot, saute onion and carrots in olive oil over medium-high heat until onions become translucent. Add beets and rutabaga, continuing to saute for about 2 minutes more. Add stock, cover, and bring to boil over high heat. Reduce heat and continue boiling until beets and rutabaga pieces are soft. Season to taste. Using an immersion blender or upright blender, process soup until smooth. Serve warm immediately or chill and serve cool. Garnish each bowl of soup with fresh parsley or dill and a dollop of sour cream (optional).